Medjugorje is the city in Bosnia and Herzegovina for relaxation, religious reflection, and cultural sightseeing. This small parish is made up of five villages, where the Virgin Mary is believed to have appeared to six Croatians in 1981. Shrouded by mystery, Medjugorje has drawn visitors from around the world. 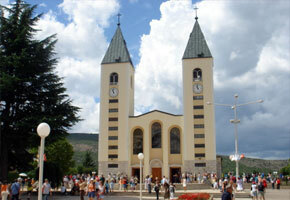 Today, you can travel most easily to Medjugorje with a pilgrimage group. If Medjugorje attracts you due to its religious significance, you can save money and lots of planning time by booking one of these special trips. If you prefer to travel alone, book a regular flight connecting in Central Europe from carriers such as KLM, Lufthansa, and Alitalia. Land in Croatia and book a bus trip to Medjugorje, which should take about three hours. Get a window seat! The beautiful views of the Adriatic coastline are unforgettable. Another travel option is to fly to Sarajevo and take the train to Mostar. Sarajevo is considered the most oriental city in Europe, with cafes and plenty of public transportation. Take advantage of this city before heading to Medjugorje to relax. You can also rent a car to travel through Medjugorje’s mountains. Arrive in Mostar by international flight on British Airways, Croatia Airlines, Adria Airlines, or Alitalia. Rent a car from this charming city to drive to Medjugorje. While car rentals can be expensive, they are worth it to enjoy the natural splendor that Medjugorje has to offer. Medjugorje is a common attraction for Catholic pilgrims, who visit Apparition Hill where Mary was reported to have been seen. Visit St. James Church in Medjugorje for a moving service in a beautiful setting. Since this town attracts a wealth of foreigners from all corners of the globe, you can always expect a diverse attendance at St. James. Visit the Kravice waterfalls. Not only is it a perfect place to hike and fish, but it’s also a great place to swim. Relax in the cooling mist that surrounds the area after noon. You won’t be in the middle of nowhere, though: there is a restaurant near the falls where you can still hear the rush of the waterfall in the air. It is recommended that visitors hire a guide to avoid getting lost and get you on your way to enjoying Medjugorje. Take a day trip to a nearby town like Mostar or Pocitelj, where you can take in more of the rich Bosnian culture and history. This three-star hotel offers reasonable accommodation, and often serves the many pilgrims who are drawn to Medjugorje. If you are visiting as a pilgrim, you can network with other from locations around the world. The Globtour Inn has a young atmosphere with welcoming staff. It’s another popular hotel for pilgrims, but even if you’re not, you’ll enjoy the community atmosphere! If you want to travel to Medjugorje, remember that you must enter Bosnia with a passport. American citizens can stay in Bosnia and Herzegovina for up to three months without a visa. If you plan a home stay with locals, you need to register with the police within 24 hours of arrival.